Before I say anything else, I have to tell you to muster up every last ounce of your willpower and let these cool to room temperature before eating them. It'll be hard, this I know. Actually, go ahead and eat one while it's still really warm—I want you to compare. You see, once they've come to room temperature, and you bite through the crisp outside and into the soft, flaky layers...the cooled butter and sugar will have formed these gooey little sugar pockets that explode onto your tongue. It's kind of magical. 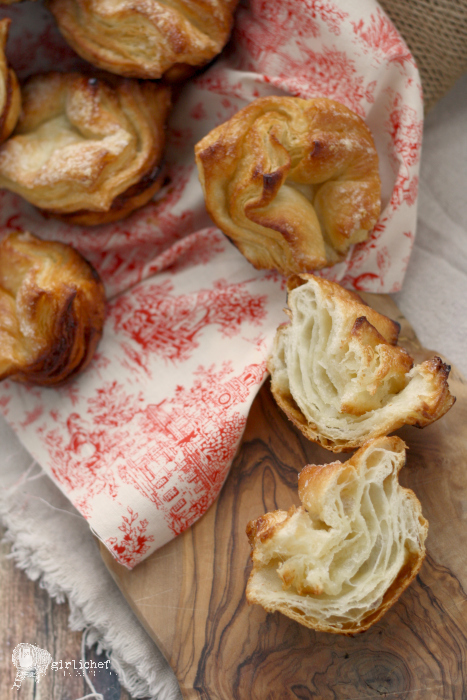 Kouign Amann, pronounced "koo-WEEN a-MON" or "queen a-mahn", is this month's Bread Baking Babes pick as chosen by Lien (our BBBabes Kitchen of the Month). I'll go ahead and admit that when Lien told us what we'd be making this month, I had never heard of it. But after looking around a bit, I first discovered that the name translates to "butter cake" in Breton, which is the ancient Celtic language of Brittany, France. Well, that in itself is enough to get me excited. 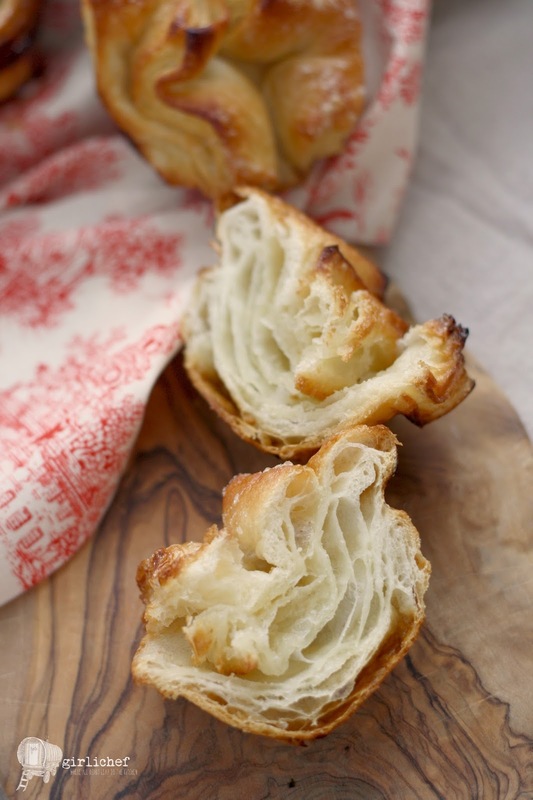 At chow.com, I read that a kouign amann "begins with a slightly stiffer version of croissant dough folded and refolded around layers of salted butter (traditional in sea-swept Brittany) and sugar, then baked in tins smeared with more salted butter and sugar that caramelizes in the oven. The result is crisp on the outside, chewy inside, and with a sweet-salt balance that the croissant can't even aspire to." Yeah—SOLD! 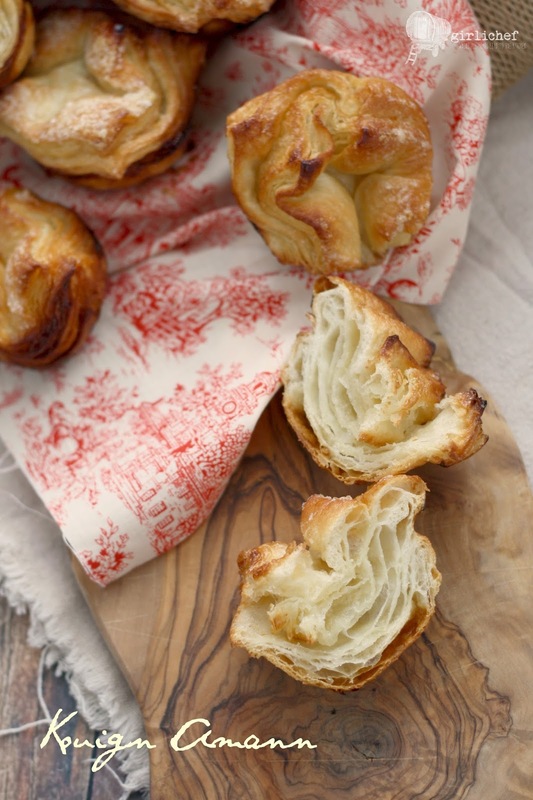 I was already familiar with the process of making a laminated dough, thanks to ventures in croissant and pretzel croissant making (oh yeah, and Prosciutto Parmesan Braids). Flaky pastries like these have always been a weakness of mine. I was eager to try my hand at the kouign amann, so obviously I waited till the last day possible to make them. Were they as brilliant as they sounded? At least! But probably more so. Next time I'll try them the traditional way, which is using salted butter...just to see if I can tell the difference. I think I'll also try sugaring the dough at every turn, and sugaring the muffin tins, as well. I'm also going to play with the shaping a bit and try folding the corners in like these (just to see if I can get a prettier top), and I also plan on making some of them in the swirled pattern like these at David Lebovitz's site. 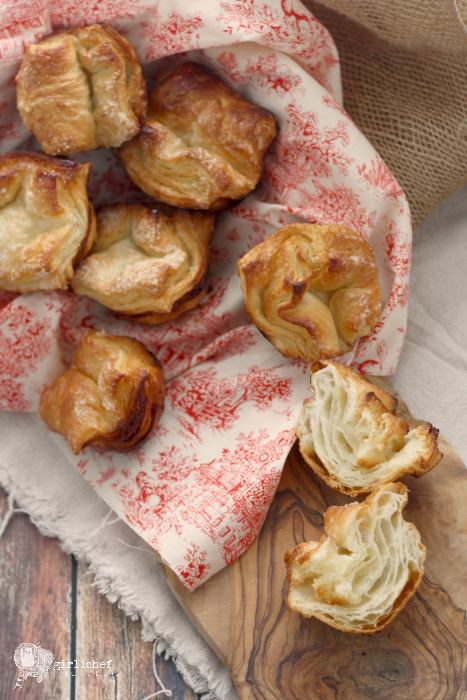 Pastry with a crisp, caramelized shell and soft, flaky insides that are accented by gooey sugar pockets. Put the flour in the bowl of a stand mixer fitted with the dough hook attachment; add yeast to one side of bowl and salt to the other. Add water and melted butter; mix on low for 2 minutes, then raise to medium and mix for 6 minutes longer. Turn dough out onto a lightly floured surface and using floured hands, shape into a ball as best as you can (it will still be fairly sticky). 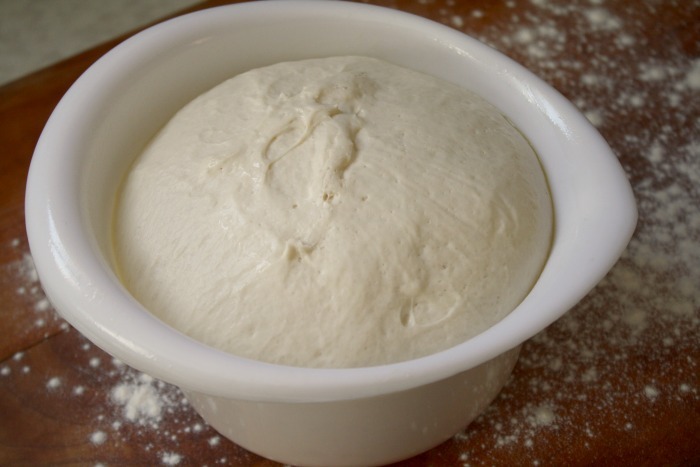 Place dough into a lightly oiled bowl and cover with plastic wrap. Allow to rise at room temperature for 1 hour. While the dough is rising, place the cold butter between two sheets of wax paper and flatten it with a rolling pin into a 14 cm (5.5 inch) square. Wrap the butter square in plastic wrap and refrigerate (you always want this to be cold when working). Turn dough out onto a lightly floured work surface and roll out into a 20 cm (7.9 inch) square. Set the cold butter square into the center of the dough so that each butter corner is facing a dough edge (a diamond set on top of a square). 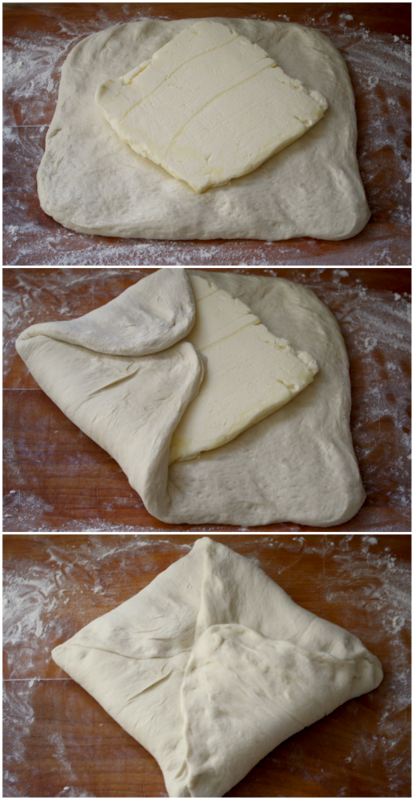 Fold the corners of the dough over the butter to enclose it. 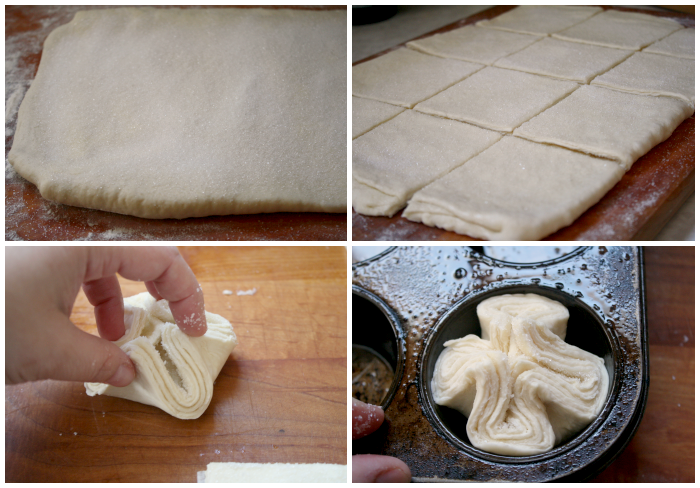 Next, roll the dough out into a 45 x 15 cm (17.7 x 5.9 inch) rectangle. Fold the bottom third of the dough up over the middle, then the top third of the dough down over that (like fold a sheet of paper into thirds). Wrap in plastic wrap and refrigerate for 30 minutes. Repeat what you did in turn one; refrigerate for 30 minutes. Once again, repeat what you did in turn one; refrigerate for 30 minutes. Generously grease a 12-cup muffin tin; set aside. 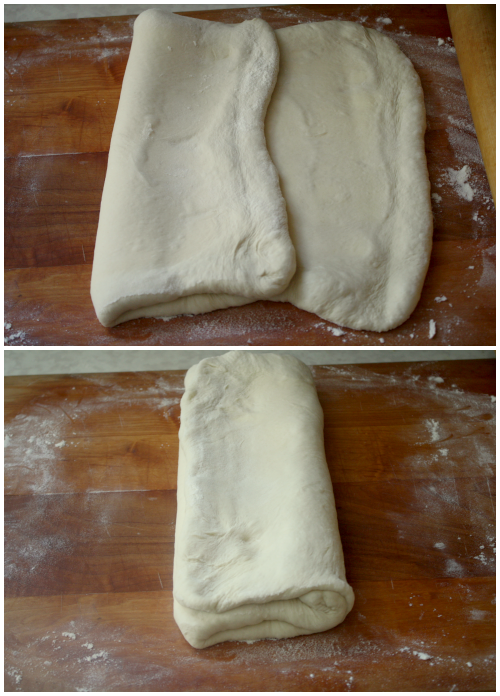 Roll the dough out into a 45 x 15 cm (17.7 x 5.9 inch) rectangle once again. Sprinkle about 2/3 of the sugar over the dough, then fold it into thirds again. Working quickly, the the dough out into a large 40x30 cm (15.75 x 11.8 inch) rectangle. Sprinkle with the remaining sugar and then cut into 12 even squares. Grab each square by its four corners and set it into a space in the prepared muffin tin, pulling the corners towards the center, so that it gathers up like a four-leaf clover. Sprinkle a little extra sugar over each one. Cover loosely with a sheet of plastic wrap or a clean kitchen towel, then let rise until slightly puffed up, ~30 minutes. Preheat oven to 220° C (425° F) about halfway through this final rise. Remove plastic or towel, then slide the tin into the oven, baking for 30-35 minutes, or until golden brown. Check halfway through baking time, and if the pastries seem to be getting too brown, then cover them loosely with foil. Allow them to cool for a couple of minutes before turning them out to finish cooling on a wire rack; don't wait too long, or the caramelized sugar will make them stick to the tin. Serve warm or at room temperature. Store any extra in a paper bag. Would you like to join us and be a Bread Baking Buddy? Our host this mont is Lien at Notitie Van Lien, if you'd like to join in, simply make Kouign Amann (yes, you may adapt) - and then send Lien your link (info in her announcement post). Submissions are due by March 1. Once you've posted, you'll receive a Buddy badge for baking along. I hope you'll join us this month!